If you’re a parent, you’re probably hoping to make the most of summer by including both fun and learning in your plans! Young Americans wants to our ideas for how you can help your kiddo learn money smarts this summer. The old-fashioned lemonade stand is a great way for kiddos to get a taste of business. And, they don’t need to stick with just lemonade! A recent stand I visited sold cookies, lemonade, and matchbox cars–a great way for kids to learn business and get rid of old toys. To find a good day and time, encourage your children to ask around for events. Is there a neighbor holding a garage sale? Maybe they could set-up near by. Is there a swim meet on a Tuesday evening? That would be a perfect time for a sidewalk stand! Earnings can be divided into three categories: money to spend, save, and share (see tip #2)! Spend Save Share Jars, like these from Fillmore Container, are a great way for kiddos to visualize where their money goes! A great way for young kids to see their earnings is to make spend save share jars. Clear containers work best! Although there are plenty of options at craft stores, reclaimed recycling containers can work just as well. Kids can decorate their jars by coloring labels, using colored paint, and/or adding feathers and pompoms. The possibilities are endless! Whenever a young saver earns money, he or she can divide it among the three jars. Don’t forget to take the savings to Young Americans Bank for safe-keeping! Another great money-making idea is for kiddos to provide help when neighbors are on vacation. Even if they aren’t old enough to take care of a pet, pre-schoolers can water outdoor plants and collect mail! As they get older, children can add services like mowing the lawn, watching pets, or even light housecleaning. Encourage your kids to take initiative and ask around to find work. Then, you can spend time planning for a special purchase with money they’ve earned. Are you taking a trip with your family? Set a souvenir and/or treat budget with your kids. This is a great way to help them learn the concept of opportunity cost and budgeting. Before they make a purchase, help your children think about it–is this the item they really want? How will this impact the budget–will there be any money left? Would they rather have an ice cream cone, or would they rather save for a stuffed animal or book–something that will last longer? 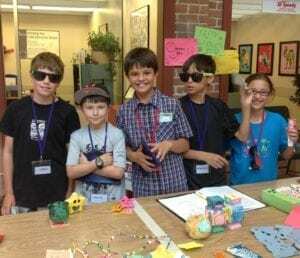 Young Americans Center for Financial Education still has a few spots left in our summer camps! Visit the Summer Camps page for details. Whatever your summer plans, it’s worth it to spend a little time talking about money with your kids. Now you have some ideas about how to make this fun for both you and them!